In the 1920s physicists developed quantum mechanics to explain spectral measurements on atoms and molecules. The aim of this FOM programme, realised at the University of Amsterdam and the KVI in Groningen, is to increasingly refine those measurements. That will allow researchers to test existing physics theories. This year the researchers used lasers to determine the vibrational frequency of a hydrogen molecule. For this they used a titanium sapphire laser, which produces relatively long infrared light pulses (of 30 billionths of a second). Then the researchers used crystals to convert this infrared laser light into ultraviolet light. They illuminated the hydrogen molecule with this light. The researchers subsequently determined the frequency of the laser by comparing this with a second laser, a so-called frequency comb laser. 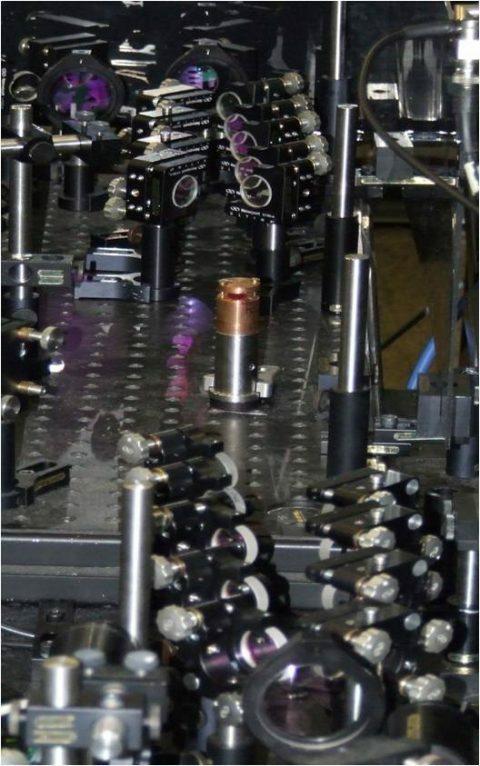 This laser is linked to an atomic clock. With this method the physicists determined that the fundamental vibrational frequency of the hydrogen molecule is 124748628(5) MHz. In collaboration with Polish groups from the universities of Warsaw and Poznan, the researchers performed calculations to determine the theoretical fundamental vibrational movement as well. For this calculation they took into account, all quantum phenomena, relativistic corrections, and the interaction with the vacuum. They found exact agreement between experiment and theory (within the measurement error). Therefore the measurements also provide a clue in the quest for a new force of nature. The standard model of physics currently has four forces of nature. Only the electromagnetic interaction plays a role in the hydrogen atom – the other three forces only make a negligible contribution. As theory and practice concur so well for these measurements, no fifth force appears to play a role. The researchers can therefore approximate the hypothetical contribution that would be yielded by a possible fifth force between hadrons (nuclear particles) at distances of one Ångström (one ten billionth of a metre). 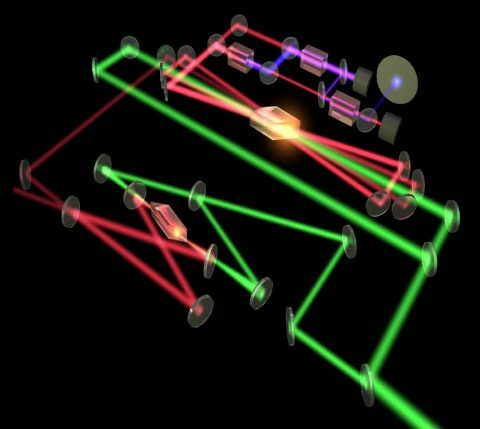 The special titanium sapphire laser built for this fundamental physics measurement also has possible applications in entirely different areas. The equipment can, for example, be used for measurements of the atmosphere. The concept of the laser has been given in a worldwide licence agreement to the German company Radiant Dyes GmbH. Configuration with a multistage amplifier that is part of the titanium sapphire laser built by the research team. Artist's impression of the optical configuration of the titanium sapphire laser, as used in the brochure of the company Radiant Dyes GmbH, which now offers the laser for sale via a licence agreement.